This week I allowed myself a really self-pitying moment: I realised that it has been at least six months since I’ve allowed myself to sit in a cafe with my daughter. She isn’t even two yet, and taking her anywhere that requires her to sit still for longer than a whole minute is literally right off the menu at the moment. It’s like trying to force a small, loud, angry drunk troll (think of a miniature Robert Downey Junior in his heyday) to play nicely with someone they don’t like. Toddlers don’t know the meaning of ‘quiet’ or ‘still’. On the rare occasions where I have tried, we usually leave the cafe several minutes later under a cloud of shame, my daughter yelling in the manner of The Exorcist, as she throws things in all directions or grinds banana into my hair. We lurch to the exit, her thrashing and wailing under my arm, trying to bite my shoulder, with me mouthing ‘sorry’ to strangers. Sometimes I get the odd sympathetic glance. But usually a few daggers are thrown my way from people working hunched over their Apple Macs. It’s okay – I GET IT. I’ve been one of those people too, wanting to harpoon parents with noisy offspring in the eye, so this is indeed karma. Anyway. The above rant has nothing to do with this recipe. 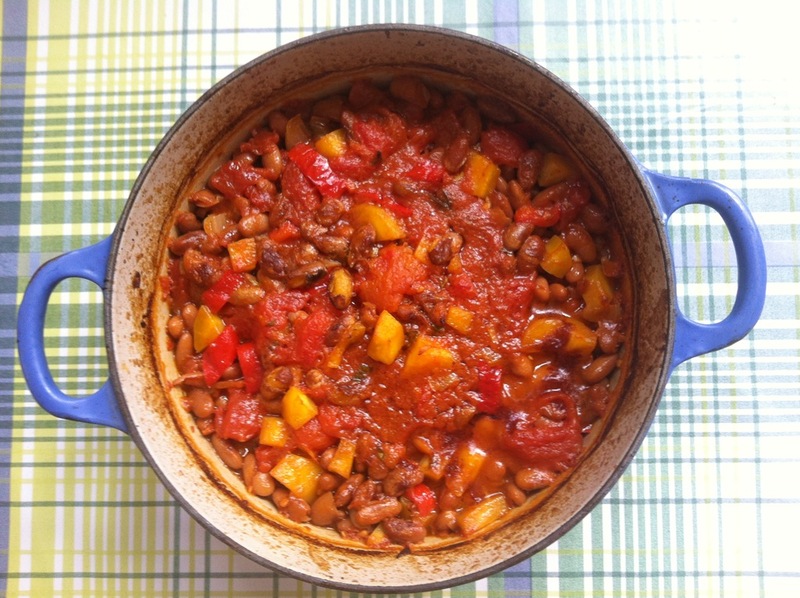 So: this is a poshed-up version of baked beans. 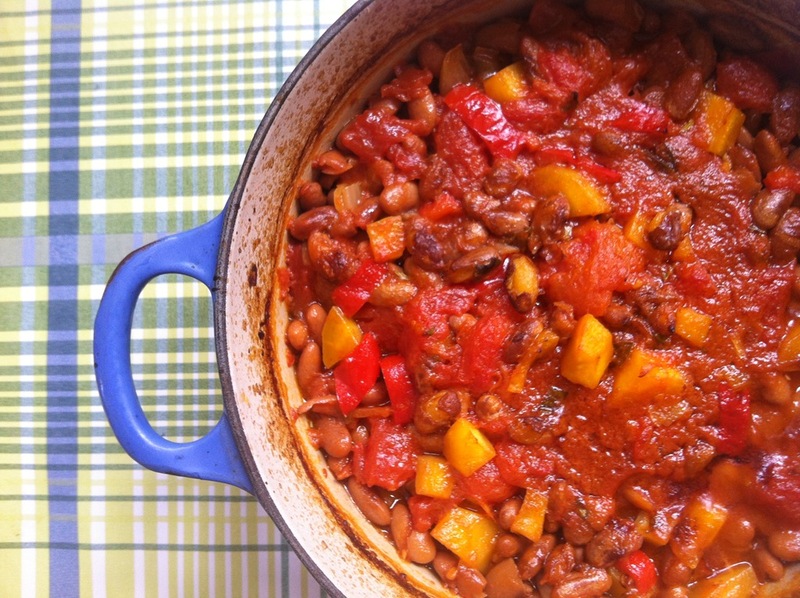 It’s loosely based on the Greek dish of ‘gigandes plaki’ – those mega oily delicious butter beans baked in a garlicky tomato sauce, otherwise known on translated Greek menus as ‘big beans’. I didn’t have any butter beans, so used borlotti instead. 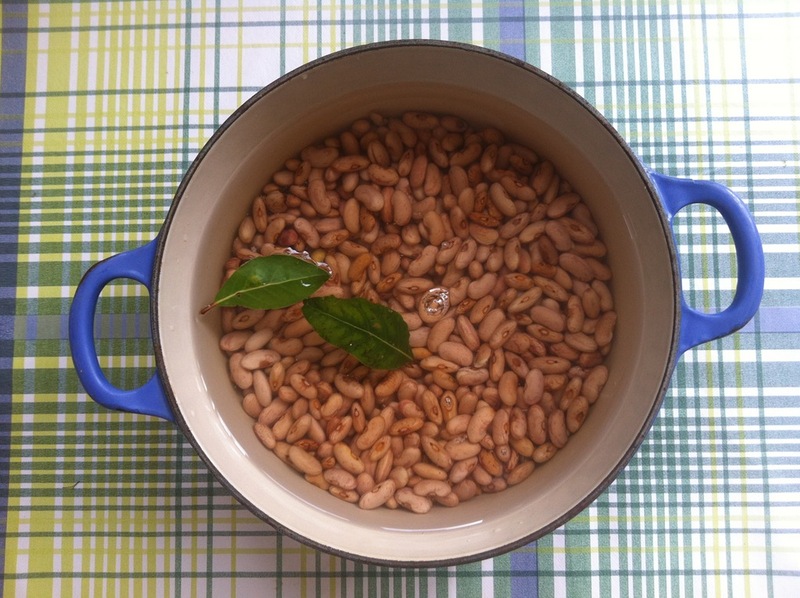 You can eat these beans hot from the oven, shovelled onto toast or a baked potato, or cooled down for a picnic lunch. You could even crumble some Feta cheese over the top for an extra salty hit, but that’s optional. Not only is this dish so easy to prepare, but when it’s cooking it fills your home with amazing garlicky scents, which, in my opinion, is a brilliant thing. I’d rather have that aroma than a tacky Ambi Pur plug-in any day! Boil up your beans according to the packet instructions, with the 2 bay leaves added to the water. Never add salt, as your beans won’t cook. If they are stubbornly refusing to soften even after an hour or so, add a 1/2 tsp of bicarbonate of soda to the cooking water, which should help chivvy them along. Pulse cooking times are notoriously unreliable, I find. In an ovenproof lidded casserole, fry up the onion, carrots and chopped red pepper together in 1 tbsp olive oil until softened – 3 to 4 minutes. Then add the crushed garlic, stir around quickly to release the aromas, then turn off the heat. Tip in the cooked beans to the onion/veg mixture, add the tinned tomatoes and the remaining seasonings and herbs, putting a couple of sprigs of marjoram/oregano to one side. Mix everything around. Add the 1/2 cup of olive oil and stir again. It seems like a lot of oil, and you’d be right! Put the lid on your casserole, then bake in the oven for 40 mins at 180C. 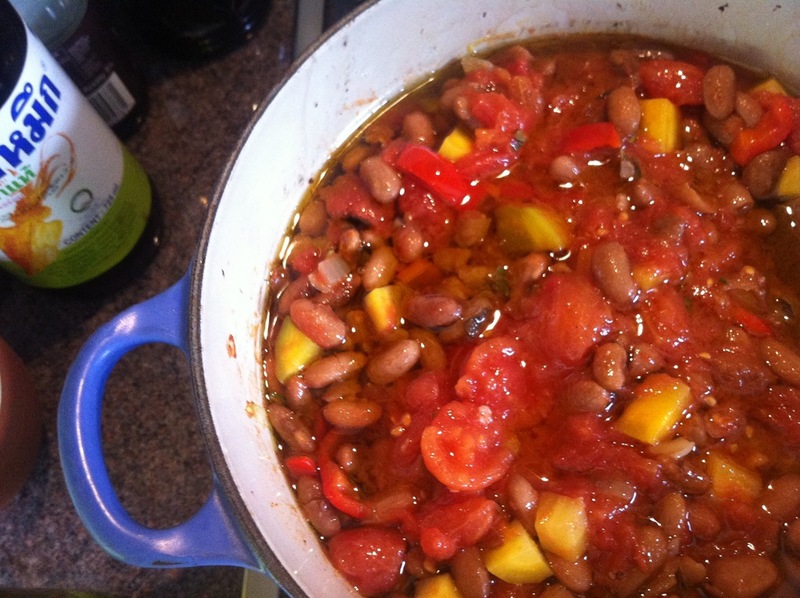 Then remove the lid and bake for a further 20 mins, so that the sauce reduces and you get a nice crusty top to the beans. When you’re ready to eat them, mix through the rest of the chopped fresh herbs for a bit of extra herbal whammy. Season if needed. You could top the beans with a bit of crumbled Feta cheese and serve with toasted Pitta breads, or jam them into a baked potato for a double-carbohydrate hit. Now that our sprog is 2-years-and-two-months we’re having a little more success with restaurants and cafes, although I have to remove all the sugar sachets on the table before she gnaws ’em. Speaking of toddlers, this would be a hit with my little boy who loves baked beans of the tinned variety. I’d feel a bit more wholesome giving him these! Another good English summer recipe! Looks great. Thanks CP! So easy to make – but be warned, you must eat it with someone else as you will both pong of garlic! Lush! Just finished. Adapted it slightly to fit time, ingredients and fear of oil but it was there in essence! Good way to use up green pepper. Used rosemary and thyme from garden. Lemon juice tang is lovely. Used less oil, then baked with lid on for 20 mins and with lid off for 20 mins, then gave it a stir and another 20 mins. Served it with mini naans as they were the only bread products in the cupboard. Channelling a Brazilian-Bengali vibe!